Eliminall Spot-On For Cats (OUTER 30 PIPETTES) is ideal for breeders or households that have multiple cats. 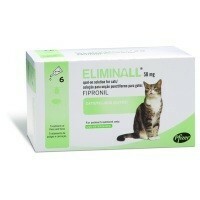 Eliminall Spot-On is for the treatment and prevention of fleas, ticks and lice infestations on cats. The treatment will kill any fleas within 24 hours and any ticks or lice within 48 hours. Please note that some species of tick may not be killed within the first 48 hours.